The Barceló Arenas Blancas is a hotel situated on the seafront in the leading beach area on the Península de Varadero, Cuba’s most famous tourist destination. The hotel offers a complete All-Inclusive programme, which, as well as meals and drinks (national and international) 24 hours a day, offers a full activity programme for both adults and children. The paradisiacal beach surrounding the hotel is the perfect place in which to relax with your partner or the family or to enjoy a whole variety of sports activities. 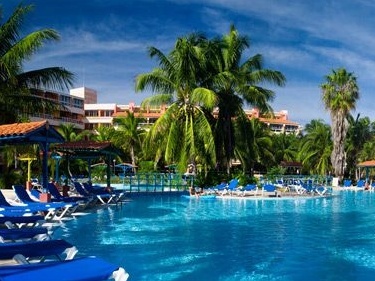 Come and stay at the Barceló Arenas Blancas! Double Guest Room: The Double Rooms are located in the main building. Rooms with 2 beds or 1 king size bed, all equipped with: air conditioning, satellite TV, telephone, minibar (restocked daily), safe, 220V, private bathroom with bath, hair dryer, balcony or terrace with sea view, pool view or garden view. Maximum occupancy 3 adults or 2 adults and one child. Suite: The Suites are located in the 4th floor of the main building. They have a living room equipped with satellite TV, minibar (restocked daily), bathroom for guests and a large bedroom with king size beds, private bathroom with bath, hair dryer, jacuzzi, air conditioning, satellite TV, telephone, safe, 220V and balcony. Maximum occupancy 2 adults or 2 adults and one child.